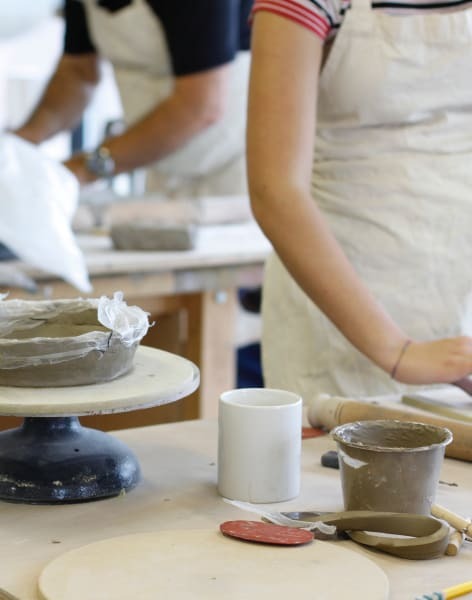 This hands-on weekend course (10 hours across 2 days) will introduce you to the versatility of clay, from making functional items like tableware to conceptual sculpture. You will be fully supported in making objects of your choice through group demonstrations and one-to-one guidance, in a fun and friendly environment, from tutors who are specialist ceramics graduates from the Royal College of Art. 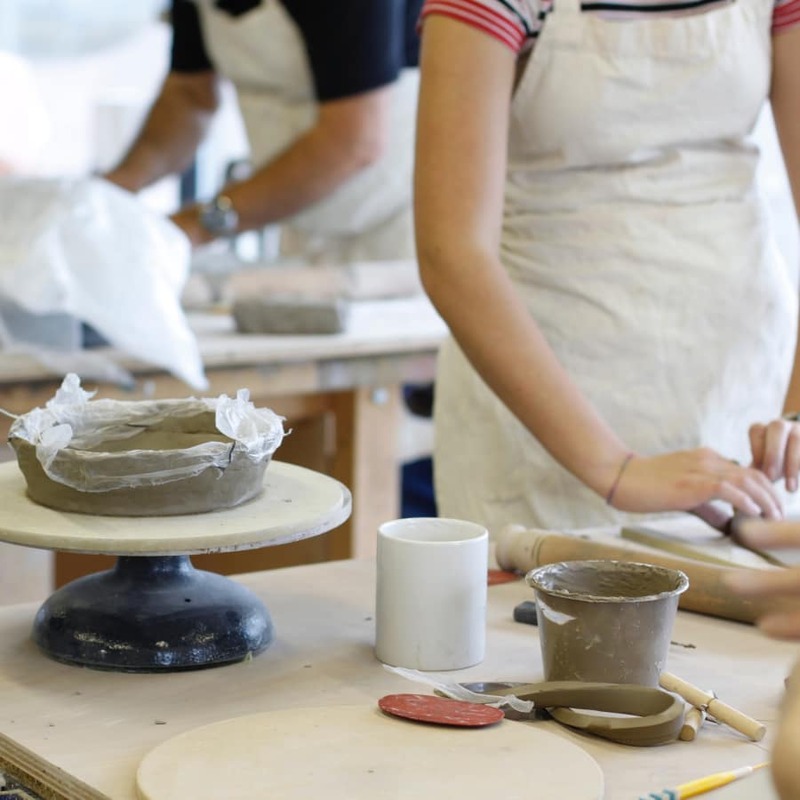 This course is ideal for a beginner who would like to experience and explore the main ways of making ceramics through pinching, coiling, slab building and slip decoration. With practical demonstrations and one-to-one tuition you will be guided through making and decorating a range of ceramic objects. These techniques have the potential to be used to make anything from functional ceramics such as mugs, plates, platters, bowls, cups, planters, to figurative or sculptural works. 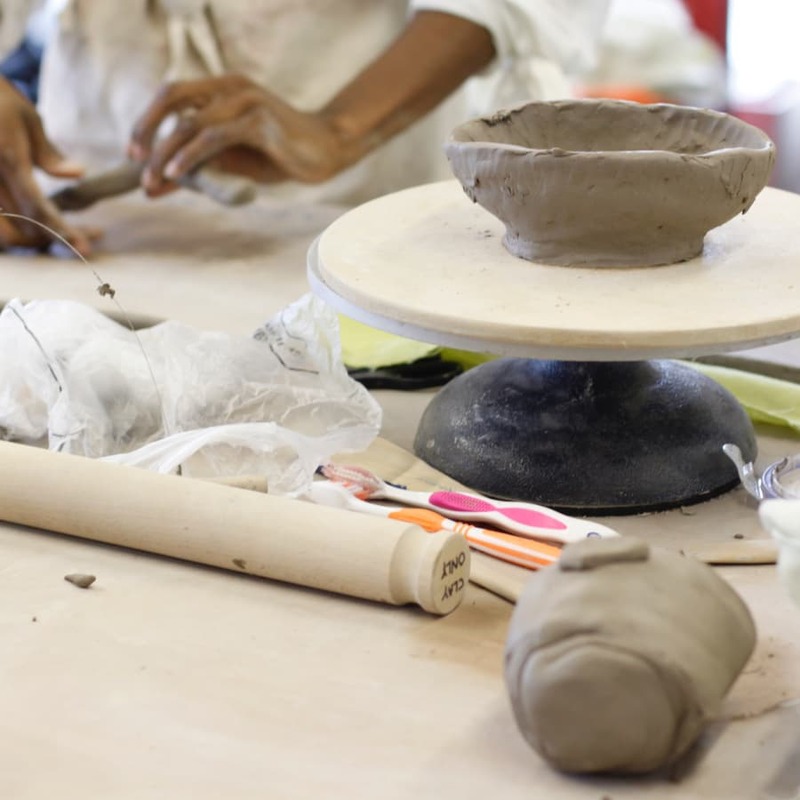 On the first day you will learn about different types of clay and their uses, how to prepare your clay through wedging, how to pinch a bowl form, roll coils, roll a slab and begin coiling a pot or object of your choice. On the second day you will learn how to roll a slab to build a cylinder, cube shape or object of your choice. We will then show you how to decorate your forms with a range of tools and techniques including painting, stencilling, sgraffito and slip trailing with coloured decorating slips. Kiln firing will also be explained and your creations will be fired after the course. Because your work needs to dry and be fired before glazing you will have the opportunity to select a piece of work to be glazed by the tutor after the course. The tutor can also advise you on alternative surface finishes. By the end of the course you will have the fundamental skills needed to hand-build anything you can imagine in clay! You can use these techniques at home or in your studio with air-drying clay or the real stuff and bring it to us to fire it for you. At London Sculpture Workshop we offer a kiln firing service for groups or individuals. Please contact kiln@londonsculptureworkshop.org for more details. If you would like to glaze the rest of you work from this course, or perhaps have something you have been working on outside of the course, you can bring it along to one of our glazing workshops. This short course gives you the opportunity to take your work and understanding to the next level, by learning how to apply glaze using a variety of techniques. My girlfriend and I, both complete beginners, really enjoyed the course! I feel like we really learned a lot over the two days. The teachers Alex and Lauren were wonderful and very attentive to everyone. And the course set up was great, small group, you learn all basic techniques and how to use different tools etc. and then work on your project, assisted by the teachers. Highly recommended. 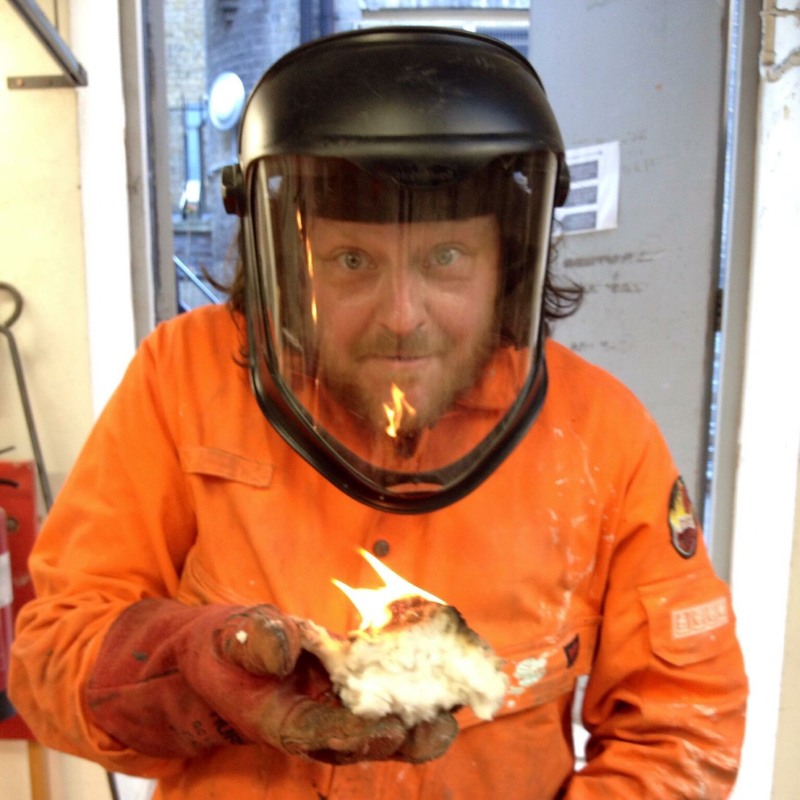 London Sculpture Workshop is an independent sculpture studio in Woolwich, South East London, located within Thames Side Studios, offering exceptional facilities for artists and those interested in making three-dimensional work. Our short course programme covers a wide variety of technical and skill-based processes, taught by practicing artists in superbly equipped workshops. We teach a range of skills including welding, casting, mould making, metal and wood work, ceramics and hot metal practices. London Sculpture Workshop is a not-for-profit, community interested company, established in 2012 by artists Giles Corby and Jessica Mello, trained at RCA and Slade. LSW has partnered with a number of prestigious organisations including; The British museum, The Crafts Council, CRISIS, The Architecture Association and Oxford Brooke's University. In 2013 and 2014 LSW was awarded the Chelsea Arts Club Trust ‘Artist Run Space Award’ and awarded a grant for our work from the Mayor of London in 2016. We offer Day, Evening and Weekend courses - ranging from a 3 hour Introduction to Welding to a 6 day Bronze Casting Course, available to book throughout the year. Classes are for a maximum of 12 people ensuring everyone is supported in a fun and friendly environment. The tutors are two RCA graduates who are experienced artists, teachers and technicians. After the course you can improve and learn new skills on our intermediate course (include link). Please note: The course cost includes all materials and two kiln firings. For health and safety reasons we ask you to wear closed footwear (no sandals or flip flops). Aprons will be provided but it can get messy. Please bring a notebook. Due to the drying and firing process the work will be ready in 2 – 4 weeks. London Sculpture Workshop will email you when your masterpieces can be collected. The workshop is open on Thursdays and Fridays from 9:30am – 1pm and 2pm – 5:30pm.